We demystify the installation of intelligent building solutions through proven products and our experience of delivering prestige residential projects. An ‘intelligent building’ provides a comfortable, energy efficient and secure environment in a non-intrusive manner, with minimal user intervention. Allied to this is the potential for automating routine time consuming activities, and optimising energy use and costs. ONYX comprises a suite of pre-built and tested ‘intelligent home’ solutions based on the GIRA building management products. This includes a pre- wired and configured control cabinet, switches and sensors complemented by a suite of on- site support services all aimed at achieving a timely implementation. Based on our experience gained delivering high end residential projects, it has been possible to shape the ONYX products to provide affordable best of breed solutions with a defined scope and cost. This is intended to minimise the risks associated with delivering real projects. The benefits of a ‘intelligent building’ are a comfortable, energy efficient and secure living environment, provided in a non-intrusive manner. Allied to this is the potential for the automation of routine time consuming activities, and the optimisation of energy use and costs. These benefits are achieved by coordinating services, such as heating, lighting and shading, across a property as opposed to the use of devices working in isolation to control lighting or heating, without considering the other services being used. Given current carbon reduction targets and challenges surrounding power generation the intelligent use of power through ‘intelligent homes’ will become essential. This thought process has already taken place in Benelux and Germany where ‘intelligent buildings’ are now mainstream. 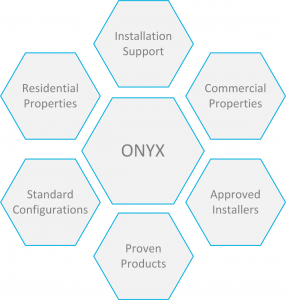 The ONYX products comprise pre-built and tested ‘intelligent building’ configurations based on the GIRA/KNX building management products. This includes a pre-configured control cabinet, switches and motion sensors and options such as door entry stations. Each configuration is documented in a comprehensive Installation Manual and Cabling Guidelines to ensure an efficient install. Connection to the ONYX actuator control cabinets could not be simpler, and comprises an incoming power feed, outgoing power connections to each fixture and an outgoing control bus connection to each switch plate or sensor. To complete the picture each ONYX configuration also includes on-site specialist technical support to underpin an efficient installation. This comprises an Initial Site Survey, Cabinet Connections and Snagging Support to address any minor issues or misunderstandings. Consequently a true out of the box experience is possible using the supplied ONYX solutions, with the advantage that further customisations are possible to meet individual or future requirements. Simplicity of installation combined with flexibility and personalisation.